Twitter’s organic search traffic on desktop went up by 20% since Google started reindexing tweets in real-time 6 months ago. According to the SimilarWeb study, this brought the total views up by 3% or 35 million monthly visits. Fortunately that was enough to create big waves of search traffic for the social network’s 4 million users. 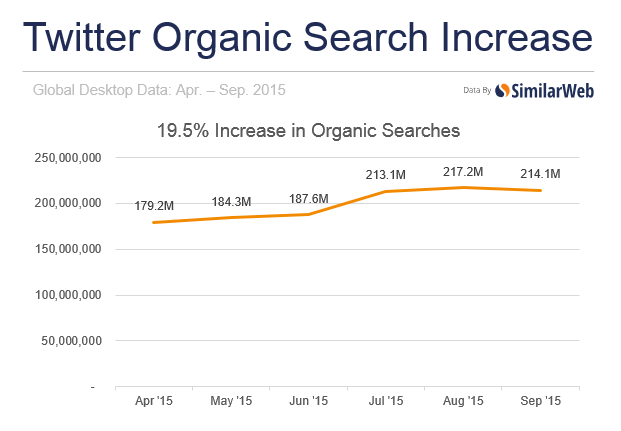 SimilarWeb also reported that the largest increase in growth was between June and July. During that time there was a 14% increase in desktop searches, equaling roughly 25 million visits. What’s more interesting is the fact that there’s an increase of people staying on Twitter and viewing multiple pages. 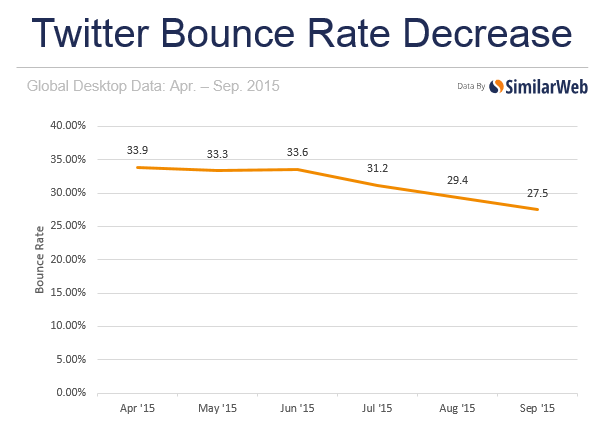 SimilarWeb study also found that Twitter’s desktop bounce rate decreased by 6.5%. It comes as no shock that the types of searches driving traffic to Twitter are those involving brand names or names of famous people. Brand and people searches are the types of queries that would normally trigger a Twitter stream in Google search. You’re unlikely to see tweets in search results for searches like “what’s the best way to cook bacon”, unless it was trending that day. Numbers going up always looks great, but what difference does it make for the everyday people on the social network? Well, for one, it gets more eyes on your tweets when people search for your name or your company’s name. Of course, this all depends on if your Twitter accounts got indexed by the largest search engine. Search for your name or your company name right now and see what’s the first thing(s) that come up. If you don’t see your Twitter feed above the fold, it could be because you’re not active enough compared to the counts that are getting indexed.